Do you work with people on the autism spectrum? 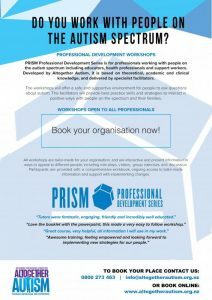 Professional Development Series workshops specifically for professionals whose jobs involve engaging with people on the autism spectrum. Experts working in the field provided information in the series and trained facilitators, who have an in-depth knowledge of the autism spectrum and associated issues, present it. Gaining knowledge, understanding and strategies can make a dramatically positive difference when working with people on the autism spectrum. Our professional development series of workshops can cover a wide variety of topics. Our public workshops cover a variety of the topics listed below. Or if your are part of a larger organisation we can tailor make workshops for your staff, choosing a selection of the topics below that are of most benefit to you. Covers understanding autism, meeting sensory needs, developing communication and social skills, encouraging flexible thinking, managing meltdowns, coping with change and working with students’ strengths. How to support people on the spectrum when they are involved in the criminal justice system as complainants, defendants or witnesses. Covers difficulties processing and retaining verbal and non-verbal information, including social use of communication and understanding humour, body language, facial expression, with practical strategies for developing greater proficiency in communication. Covers relationships challenges with family and friends, teamwork and social situations with tips and techniques for overcoming these challenges. Navigating the system to obtain supports and services for people on the autism spectrum, including entitlements from government agencies. Strategies for an easier transition between activities, people, situations and schools. Practical tools to create an individual long-term transition plan. An overview of autism spectrum and covers topics such as diagnosis, myths and facts of causes, medication and therapies. Obsession, routines, repetitive behaviour and sensory issues are covered, with strategies for dealing with anxiety and challenging behaviour. If you have a topic that you would like covered that we aren’t offering, contact us to discuss whether we can create a course that would suit the needs of your organisation. Three grants are available to help the disability workforce, disabled people and whānau take part in workforce and leadership development activities.